Dolphin House is located on Little Hickory Island, surrounded by the Gulf of Mexico and halfway between Naples and Fort Myers. Private residences only are permitted in this section of the beach, and the lack of crowding testifies to this. The beach is 150 feet west of the front door and is teeming with ocean life, especially in summer. May through August is turtle nesting season, with tracks and nests dotting the shoreline. Shelling and bird watching is excellent here also with heron, egret, eagle, osprey, pelican and gull all present. This owner-maintained residence has been completely refurnished, including new leather furniture and carpeting throughout (Dec 09). The gas heated, screen enclosed pool (completely renovated Jun 09) provides a private place to relax after enjoying the beach, where the gulf water temperature in summer is 31 degrees celsius. Dolphin House is ideally located for a morning walk on the beach or taking in the evening sunsets. If the dates that you are requesting show as unavailable on our calendar, please check our sister property at 1722736 which is available per week, please inquire. Area attractions: Many activites are available in the local area, including parasailing and jet ski rental available at the beach. A full service marina is located at Wiggins Pass, one mile south on beach that provides boat rental and guided fishing excursions into the gulf. Corkscrew Swamp, an 11,000 acre preserve run by the Audubon Society is 45 minutes drive east. Alligator, birds, fish and snakes are observable in their natural environment from a 2.5 mile boardwalk through the swamp. The Jay Ding Darling Wildlife refuge is 25 minutes north up the beach on Sanibel Island and offers excellent views of migratory water bird life. Naples is 15 minutes south by car with numerous restaurants, museums, a fishing pier and shops. Ft Myers is 20 minutes north up the coast and also has a fishing pier. The Southwest Florida International Airport is located there and is a 25 minute drive from Dolphin House. House details: The interior of Dolphin House is updated, spacious and comfortable. Convenience is afforded by the fact that everything is on one level. All rooms in the house have glass doors facing out to the pool area. The shower in the master bath is oversized for 2 persons, and the second bathroom has a full bathtub/shower. The A/C system is new, cool and quiet. We have two televisions, a large screen in the family room and a second set in the master bedroom. The interior furnishings were updated in Dec 09 including leather furniture and new carpeting. For convenience, there is an attached two car garage with automatic door opener. Entire pool area was renovated in June 09. Beach is accessed by less than a two minute walk across the street. Beach details: Bonita Beach has been included in the top 10 beaches in America, and is well-suited to swimming. Sloping gently for miles into the Gulf of Mexico, the sandy bottom is comfortable and the gulf wave action is generally mild. Pelicans, terns, osprey, frigate, heron and other sea birds can be seen at the beach along with dolphin, the occasional whale, and sea turtles. Sunsets over the water are beautiful and panoramic. Bonita Beach streches for six miles along the Gulf of Mexico only 150 feet from the front door of Dolphin House. This area of the beach is residential and uncrowded, allowing for the ideal beach experience. Beach access #3 is located two houses north of us and makes it possible to walk to the beach in less than two minutes. Shelling is a popular activity on Bonita Beach as many beautiful specimens can be found in the clean sand. We have vacationed at Bonita Beach for over 20 years. 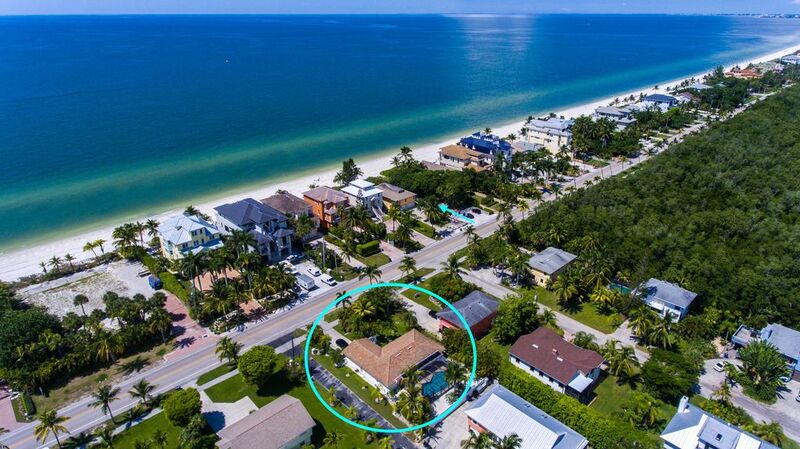 Proximity to the beach, which is the primary attraction for southwest Florida. Walk to the beach for morning fishing and evening sunsets. No car to park, no planning, just go when you feel like it. Both baths have been renovated. Master bath has a tile 2 person shower. Second bath has tub and shower. Each bedroom has an attached full bathroom and a glass sliding door that opens out to the pool. The master bedroom has a king size bed and the second bedroom has two single beds. The sofa in the family room becomes a double size fold out bed. There are two television sets, one in the master bedroom. Each room has a ceiling fan. Beach chairs and towels are provided. A portable cooler on wheels and beach umbrella is provided also. Thanks for taking the time to write a review Steve. We are glad to hear that you enjoyed your stay and hope that you can return some day. There are three important things in business. Location, location, location! This place has it. The positives of the location make up for the little problems we faced. Main TV in living room was nice and big, the one in the master bedroom not so much it has a dark shadow across the middle of the picture. Remotes needed new batteries and there were a few lightbulbs that needed to be replaced. As previous renters have stated the refrigerator has issues. All the shelves in the door don't work as the metal retainer is either missing or falling off. Not a problem just annoying. The second bathroom floor needs some attention as the stick-on tiles are coming off. The master bedroom bath has carpeting in it appeared and smelled clean but I have my doubts. The kitchen cabinets need to be replaced as some are falling apart at the base. That being said the pool was great. A day at the beach and coming back for a relaxing dip in the pool was awesome. The couches were clean and comfy to sit on. The beds were comfortable and clean. The master shower was nice and big. Plenty of closet space with an abundance of hangers. There is a nice garage to park in. All the appliances worked and the washer and drier are brand new as they were delivered when we were there. Plenty of dishes pots and pans to cook with. A gas grill would be nice. The beach chairs and umbrella were in the garage and ready to go. There were also two bikes in the garage that we used daily to go to happy hour at Jacks and The Fish House. Overall I give it 5 stars because of location and the fact that we stayed towards the end of the season and who knows when some of these issues happened. A fresh coat of paint after season and it will be in good shape. Tim responded to any questions we had in a very timely manner usually within 10 minutes.. I would recommend it to a friend and I would stay there again. Thanks Thad, for taking the time to provide such a detailed review, as we appreciate all comments. We have reserved the second half of the year on our rental calendar in 2019, in order to provide a complete remodel of the house. All of the above items mentioned will be addressed during the process. Dolphin House is located on Little Hickory Island in sub-tropical southwest Florida. We are surrounded by the Gulf of Mexico to the west and Fishtrap Bay to the east (see aerial photo). The setting is authentic Florida with coconut palms and seagrass on the beach dunes. This section of Bonita Beach is residential single-family housing only, and the beach is very natural and uncrowded. From the beach, Fort Myers is visible to the north and the Naples skyline can be seen to the south. During winter months, southwest Florida is the warmest spot in the U.S. and during summer months, an ocean breeze moderates the temperature. Bonita Beach has great opportunities for shell collecting along it's six miles of sand beach. A fishing pier is located in Fort Myers Beach, a 20 minute drive north along the coast. The convenience of walking across the street to the beach provides easy access to the natural beauty of the ocean, providing for a carefree and relaxing vacation. See our other property Casa Bonita Royale, property number 1722736 on Homeaway.